Digitized historical newsreels from the Associated Press and British Movietone have been made available on YouTube. The films go back as far as 1895, and cover almost everything you can think of…live footage of significant historical events such as the burning of the Belsen concentration camp and bombing of Pearl Harbor, fashion including ridiculous sunglasses in 1971, sports (Highland games! ), entertainment such as “50 years of movies” celebrating fifty years of moving film, interviews and portraits of notable individuals, and real oddities like the dog walking machines from 1937 and a barrel rolling contest. 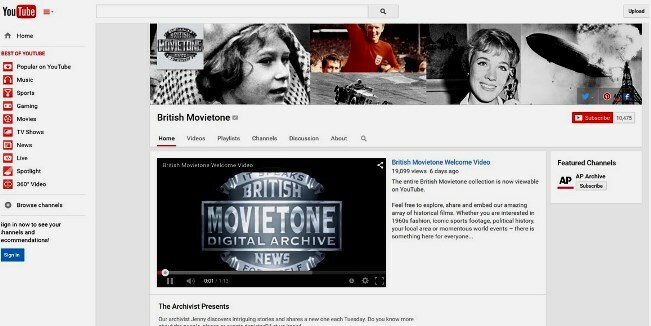 Search YouTube for “british movietone” and whatever else you want. Enjoy. And thank you, James, for bringing this to my attention. This entry was posted in around the world and tagged Associated Press, British Movietone, film, fun stuff, history, news, newsreels, video, youtube. Bookmark the permalink.